Four high school girls united by a love of art face the trauma of a Valentine’s Day dance and all that it entails. 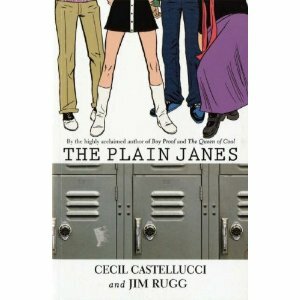 You don’t have to be a teenage girl to read and thoroughly enjoy this book. You also don’t need to have read the first book, but it is a very good excuse to. This is a charming and engaging tale of struggling to find yourself and dealing with just how big the world seems when you are young. It isn’t patronising or cutesy and will speak to part of you that wishes the world were simpler or brighter than it is. The art is comic style in the best possible way and uses black, white and grey in intelligent and creative methods. With a large cast, a lot of dialogue and an internal monologue the lettering does a great job making things easy to follow. I hope there will be more to come as this gets a Thumbs Up! You have seen this story before. A girl moves to a new town, starts a new school, makes new friends and has an adventure. It’s a sweet tale that reminds you that the beauty of life is in simple things and being yourself is the key to happiness. But this take is full of neat little ideas like pen pal in a coma, guerrilla artwork, and a school named after an astronaut. It proves you don’t need explosions, although there is an explosion, or people getting arrested, although someone does get arrested, to add drama. You can do it in a subtle way. The art is solid black and grey without any shading or graduation. This works perfectly and handles day and night scenes equally well. Some nice angles help draw you in and add depth to the 2D illustration.